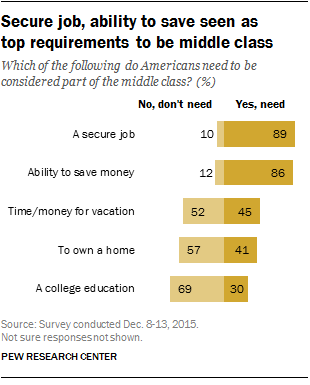 What does it take to be considered part of the middle class these days? The vast majority of American adults agree that a secure job and the ability to save money for the future are essential. The public is more evenly split when it comes to owning a home and having the time and money to travel for vacation. But one thing is now less likely to be seen as a requirement: a college education. While the economic gap between college graduates and those with a high school education or less has never been greater, the share of adults saying a college education is necessary to be middle class has actually fallen since 2012, from 37% to 30%, according to a Pew Research Center survey conducted Dec. 8-13, 2015. There is a wide gap between men and women on this measure. About a third of women (35%) say that a college education is needed to be in the middle class, but only 26% of men say the same. Millennial women outpace Millennial men in educational attainment, and indeed the gap in opinion is wider between women and men who are ages 18 to 49 than among those ages 50 and older. There is virtually no difference by age or education level in views about whether a college education is necessary to be middle class. This reflects a sharp drop since 2012 in the shares of the youngest and least educated adults who said a college education was necessary. In 2012, 43% of 18- to 29-year-olds and 41% of those without a college degree said a college education was necessary to be middle class; today roughly three-in-ten of both groups do. The value individuals place on a college degree differs significantly by income. Among those with an annual household income of less than $30,000, 40% say a college degree is necessary to be in the middle class, compared with 26% of those who make $30,000 to $74,999 and 22% of those who make $75,000 or more. This has changed little since 2012. A college education’s perceived importance in being part of the middle class also differs by what social class people feel they are part of now. Those who consider themselves part of the lower and lower-middle classes are more likely than those in the middle or upper-middle/upper classes to say a college education is key to being middle class. Democrats are twice as likely as Republicans to say a college education is necessary to be in the middle class (40% vs. 20%), a gap that has stayed consistent since 2012, when 42% of Democrats and 27% of Republicans said the same. Overall, Hispanics were more likely than non-Hispanic whites to consider factors we asked about to be necessities for being part of the middle class. For example, about six-in-ten Hispanics (57%) say that owning a home is necessary, compared with 38% of whites. Blacks fall between these two groups on most measures. The one exception is having a secure job – 89% of both whites and Hispanics and 85% of blacks see it as necessary. Some regional differences exist. For example, 61% of American adults who live in the Midwest say that having the time and money to travel for vacation is a requirement to be in the middle class, while half or fewer of those who live in other parts of the country say the same. Those in the West are more likely than those in the Northeast or Midwest to say owning a home is a necessity. And those who live in the Northeast put more of an emphasis on a college education than those in the South or Midwest. The concept of a “middle class” can be measured in different ways. For example, when looking at economic measurements, we often group people by household income, defining the middle class as households with an income that is between 67% and 200% of the overall median household income, adjusted for household size. For our surveys, however, we ask respondents which of the commonly used names for the social classes – upper, upper-middle, middle, lower-middle or lower – they would say they belong in.